Automakers up 27% in Feb. after 41% rise in Jan.
Production at Porsche (shown) was down 6% to 11,689 cars after 2 months. 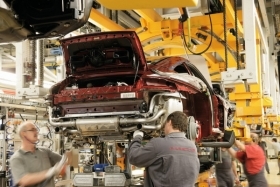 MUNICH -- European auto production increased 27 percent in February to 1,336,724 after a 41 percent rise in the first month of the year, according to estimates from J.D. Power Automotive Forecasting. January's hot start was caused by government-funded scrapping incentives in key European markets and a comparison with a very bad January 2009. February's less impressive rise is considered an indication of things to come for Europe as incentive programs, which artificially boosted demand last year, run out of cash. Many European auto executives and market watchers predict that the region's 2010 sales will drop by 10 percent – about 1 million to 1.5 million units. After two months, output is up 33 percent to 2,609,544 units in western and eastern Europe including Russia and Turkey. But that is well below the 3,458,1515 vehicles made after two months of 2008, which is before the global financial crisis sparked temporary car plant closures all over Europe.